“Think about it, why would you make something that you’re going to use for a few minutes out of a material that’s basically going to last forever, and you’re just going to throw it away. What’s up with that?” – Jeb Berrier (Bag It movie). We’re trying to spread awareness about the issues of single-use plastic and how easy it is to shop plastic free. One Friday morning we took @FizzySnood , a RubyMoon Bikini and a camera and marched down to HISBE Food supermarket. We had a so much fun shooting Sarah in the aisles of the supermarket, during opening hours, in her RubyMoon bikini. As well as turning a lot of heads, we created awareness about how fun and easy it is to shop plastic free! 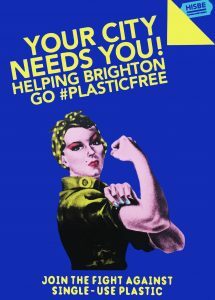 We now have a collection of amazing images we can use to spread the message about plastic free shopping. During plastic free July we wanted to create a huge emphasis on how easy it can be to avoid single use plastics and the other alternatives you can incorporate into your everyday life to reduce your plastic usage. The amazing “Fizzy Snood” performed above and beyond on our shoot! Her bubbly, positive personality showed throughout the whole morning and is most definitely reflected in the photos produced. After being diagnosed with cancer in July 2014 she took it upon herself to control of her own fate. She shaved her head and began her quest of 365 days of crazy headgear! Everyday she posts a different photo across her social media of crazy, fun, quirky headgear. Whilst doing this she is raising money for Macmillan Cancer Support you can donate (here). She actually created her own headgear to match our bikini for the photo shoot and we think it looked great! Sarah was the perfect model to team up with on this shoot and we loved the enthusiasm she had for the cause. The perfect time for us to create this campaign was of course during #PlasticFreeJuly. “Imagine a world without plastic waste. That’s our mission – to build a global movement that dramatically reduces plastic use and improves recycling, worldwide. ​Will you join us and give up single-use plastic this July?” – plasticfreejuly.com, you can find a whole A-Z list of alternatives to swap out your plastic here as well as more information about how to get started with plastic free July and join the movement in reducing our plastic waste. Text & Photos By Bridget Upton. ← Sail Away! – With The Incredible SailBoat Project!